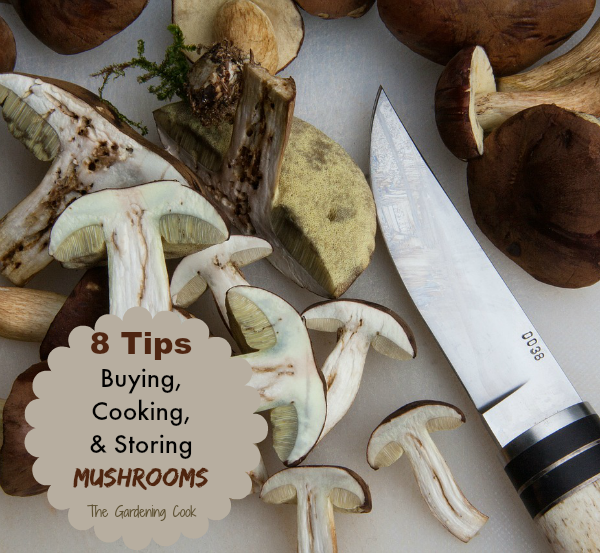 Tips for Cooking with Mushrooms – Buying, Storing and More! Mushrooms are one of my favorite vegetables. 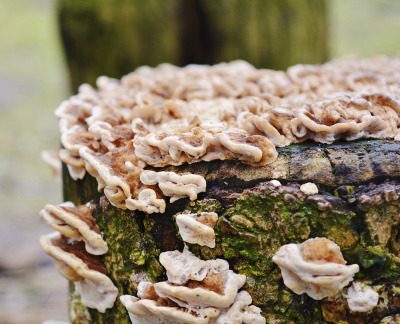 They are a member of the fungus family and have been used in recipes since the early Roman and Greek times. 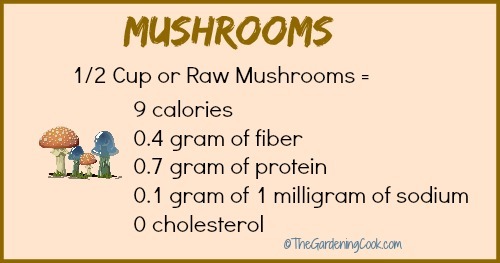 Mushrooms are very low in fat, packed with nutrients and delicious too. It takes just a bit of understanding as to how to get the most out of them. Follow these tips for cooking with mushrooms to ensure that every meal in which you use them as an ingredient will turn out perfectly. Buy Fresh. This is not always easy, since mushrooms are often sold wrapped with cling wrap. Purchase them loose if you can. If packaged, look for signs of slime, mold or shriveling which indicates age. Choose firm, evenly colored mushrooms, and this is easier if you select them personally. Preparation. 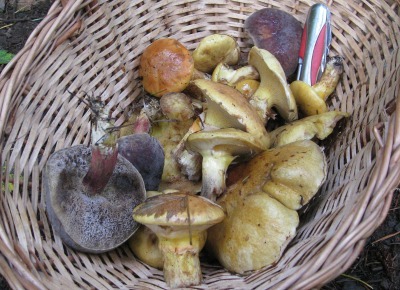 Most mushrooms do not require cleaning, but do look for dirt or grit. Nothing is worse than biting into a stuffed mushroom that has a bit of grit in it! Just wiping with a damp cloth is normally all that you will need to do. Before cooking, trim the stem. This is often a bit chewy. (sometimes I chop it and add to other ingredients if I am doing stuffed mushrooms. Storage. Keep them in the fridge for up to about 3-4 days. Too much longer than this and they will get slimy or shrivel. Don’t wrap them in cling wrap. I keep mine either in a brown bag, or on the tray they are sometimes packaged in and covered with a damp paper towel. Ways to cook. Sautéing is the most common method of cooking mushrooms, but they can also be grilled, broiled, or roasted. Some people cook them in the microwave for 2-3 minutes, but I am not fond of them cooked this way. My favorite way to use mushrooms, is either stuffed as appetizers or in a sauce. Photo credit: “Sauce champignons”. Licensed under CC BY-SA 3. Don’t Crowd the pan. 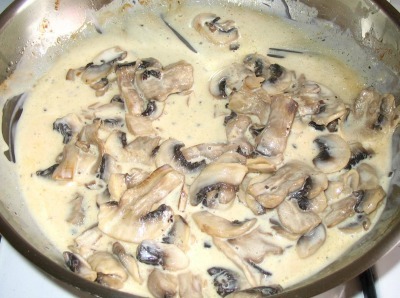 Mushrooms are very high in water content and need room around them when they cook. If you put them too close to each other, they will steam, not sauté. 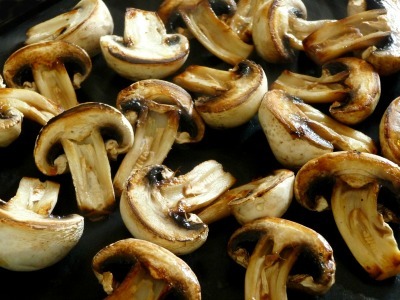 One of the best ways to enjoy mushrooms is when they are caramelized, which is almost impossible if they are crowded. Don’t be impatient. When you want to develop that lovely caramelized outside, be sure to let them site before stirring or turning. Walk away for just a few minutes. You will be glad you did! When to eat them. 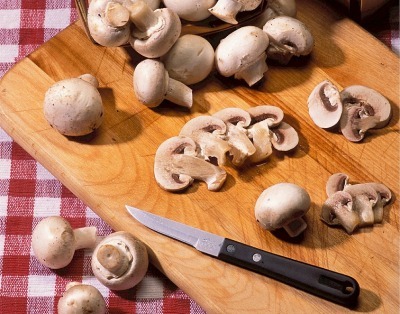 Mushrooms are best eaten right after cooking, or the flesh will darken and not be as appearing. This does not matter so much if you are using them in a sauce, but for appetizers, such as stuffed mushrooms, appearance is more important. Growing Season. 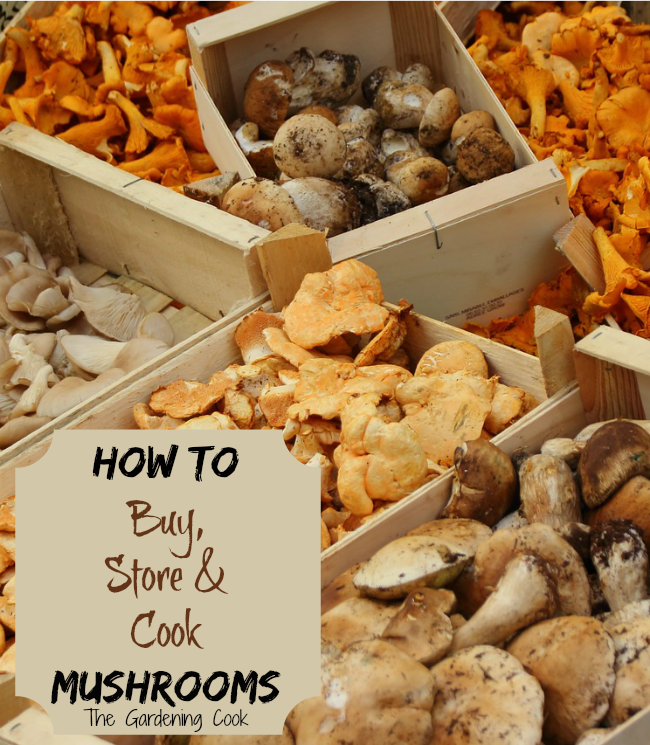 Mushrooms are available year round but are at their peak growing season in Fall and Winter. Since they feed on decaying matter, this is the time of the year that they are at their best. Nutritional info. There is nothing quite like a mushroom for delivering bang for the buck in the nutrition department. They contain both niacin and riboflavin (both B vitamins). 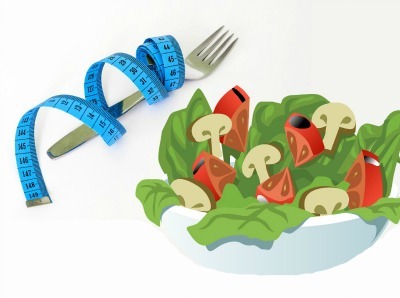 Although the nutritional info varies according to type chosen, a half cup of raw mushrooms has a mere 9 calories, about 0.4 gram of fiber, 0.7 gram of protein and only 0.1 gram of fat. At 1 milligram of sodium and no cholesterol at all, they are a perfect food for dieters. Are you convinced yet of the benefits of this delicious food? 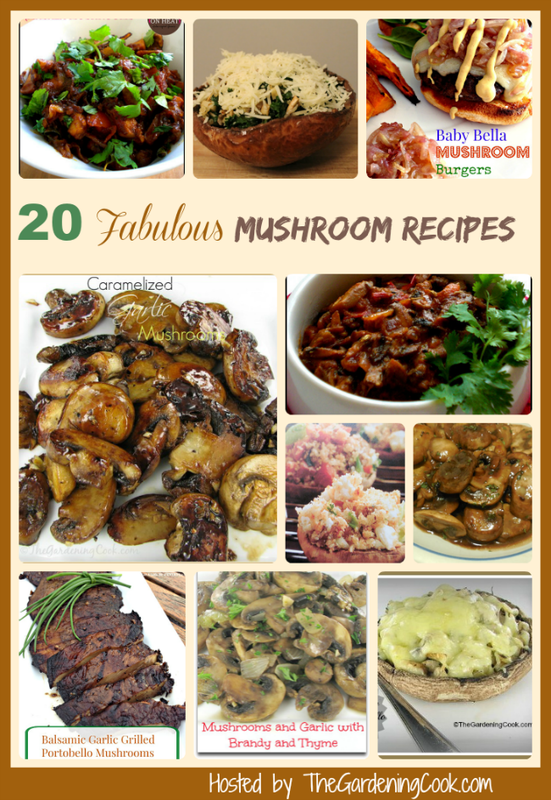 Here are some of my favorite Mushroom Recipes : 1. Sauteed Mushrooms with spinach and garlic. 2. Mushrooms and Garlic with Brandy and Thyme. 3. Stuffed Mushrooms with Cheddar Cheese. 4. Mushrooms, sugar snap peas and Baby Tomatoes in Wine. 5. Portabello Mushrooms Stuffed with Laughing Cow Cheese. 6. Stuffed Mushrooms with Quinoa and Kale. 7. Sauteed Mushrooms in Teriyaki Sauce. 8. Baked Stuffed Portabello mushrooms. 9. Mushrooms stuffed With Spinach. 10. Basil Steak with red wine and mushrooms. 18. 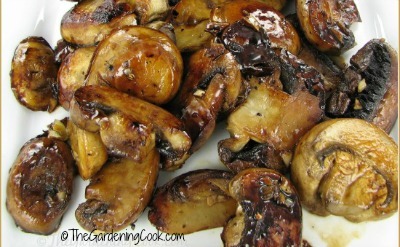 Balsamic Grilled Portabello Mushroom slices. 19. Baby Bella Mushroom Burgers. 20. Wasabi Plum Grilled Mushrooms. 22. Crab and Brie Stuffed Mushroom appetizers. Images used in this article which are not watermarked or attributed are public domain photos from Pixabay and Morgue File. See more stock photo sharing sites here. Do you have some favorite mushroom tips that you would like to share? Please leave them in the comment section below.